United Ways throughout the network are joining in efforts to support Mile High United Way and the people of Aurora, Colorado following the tragic event last week in their community. Mile High United Way has been instrumental in helping to lead critical local response efforts, and will continue to need the support of the entire network to address their on-going challenges. “Mile High United Way is extremely grateful for the outpouring of concern and support surrounding the senseless violence and the innocent lives lost and those forever changed as a result of the Aurora Theater shootings. We are mourning along with our neighbors and friends. For those who wish to help support the victims of this unimaginable event, we ask that you join in the collective effort of our community and visit GivingFirst.org to donate to nonprofits supporting the victims and families of the Aurora movie theater shooting,” said Christine Benero, resident and CEO of Mile High United Way. Human needs following events like these are significant and require the ability to connect the community with a centralized area of support. To the end, Governor John Hickenlooper has asked United Way to help coordinate the use of 2-1-1 as the emergency number to receive critical support information. United Way Worldwide has been in direct contact with Christine and her team and will continue to help further facilitate network-wide support for their efforts. Again, if you would like to provide financial support, please direct it to GivingFirst.org. 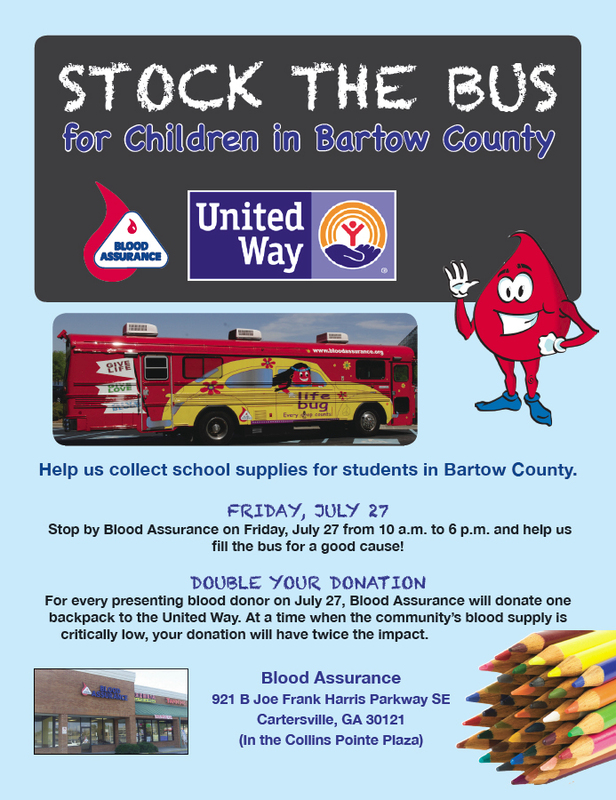 Blood Assurance teams up with United Way of Bartow County to help kids get ready for school! Help us collect school supplies for students in Bartow County. fill the bus for a good cause! critically low, your donation will have twice the impact. Boys and Girls Bike ride has close to 700 participants : Thank you Daily Tribune for the article!! As a cyclist in Saturday’s Cartersville Century, Liz Fox braved the scorching temperatures to benefit the Boys & Girls Clubs of Bartow County. Riding alongside other members of the Cartersville-based Red Top Cycling Club, Fox participated in the ride’s 50-mile route. Embarking on their journey before the temperature surpassed 100 degrees, about 700 cyclists participated in the Boys & Girls Clubs of Bartow County benefit. Started in 2000, the Cartersville Century has grown exponentially over the past decade, becoming the organization’s largest single fundraiser of the year. The ride, which also offers cyclists rest stops every 10 to 15 miles along the course and a post-ride meal, was expected to net the Cartersville nonprofit about $50,000. “We’ve gone from originally five volunteers and 160 riders to between 900 and 1,000 riders annually with about 200-plus volunteers,” said Gordon Gilley, chief professional officer for Boys & Girls Clubs of Bartow County. “[Cyclists come from] all over the Southeast [and] the metro area. … It’s a ride, not a competition. So anybody can participate. It’s 15, 30, 50 miles or a century route — a 100-mile route. Opened in May 1990 at the Goodyear Clubhouse in the Atco community, the Boys & Girls Clubs of Bartow County’s temporary location drew 110 children in its first week and 400 by the end of the year. Today, the nonprofit features two locations — 642 Henderson Drive in Cartersville and 127 King St. in Adairsville — and serves 300 to 350 children a day with its summer program. During the school year and the summer, the units offer youth ages 6 to 18 supplemental education and activities like arts and crafts, basketball and board games. “A vast majority, an excess of 90 percent of young people that are involved and stay involved in our Boys & Girls Clubs finish high school,” Gilley said. “About 20 percent of them go on to some post high school education opportunity and finish that. Among the nonprofit’s network of support is Adam Wade, who grilled hot dogs and hamburgers for Saturday’s post-ride meal. Volunteering at the Cartersville Century since 2003, the Cartersville resident enjoys lending a hand to the local Boys & Girls Clubs. Thank you Bartow Buzzard for today’s facts and letting us share!! Today in History: 1776 – The Second Continental Congress, assembled in Philadelphia, formally adopts Richard Henry Lee’s resolution for independence from Great Britain. The vote is unanimous, with only New York abstaining. 1850 – The gas mask was patented on this day. It was an invention of B.J. Lane of Cambridge, MA. 1867 – New York City’s first elevated railroad officially opened for business. Commuters soon called the mode of transportation the El. 1881 – Only four months into his administration, President James A. Garfield is shot as he walks through a railroad waiting room in Washington, D.C. His assailant, Charles J. Guiteau, was a disgruntled and perhaps insane office seeker who had unsuccessfully sought an appointment to the U.S. consul in Paris. The president was shot in the back and the arm, and Guiteau was arrested. Garfield, mortally ill, was treated in Washington and then taken to the seashore at Elberon, New Jersey, where he attempted to recuperate with his family. During this time, Vice President Chester A. Arthur served as acting president. On September 19, 1881, after 80 days, President Garfield died of blood poisoning. The following day, Arthur was inaugurated as the 21st president of the United States. 1921 – The first prize fight offering a million-dollar gate was broadcast on radio. Jack Dempsey knocked out George Carpentier in the fourth round of the bout in Jersey City, NJ. 1933 – Baseball great Carl Hubbell of the New York Giants hurled 18 innings of shutout ball to lead the Giants to a 1-0 win over St. Louis in the first half of a doubleheader at the Polo Grounds in New York. The Giants took the nightcap, as well, by an identical 1-0 score. 1937 – Aviator Amelia Earhart and navigator Fred Noonan disappeared over the Pacific Ocean while attempting to make the first round-the-world flight at the equator. 1951 – NBC radio presented Bob and Ray (Bob Elliott and Ray Goulding) on a network radio show. The comedians had previously been heard on WHDH Radio in Boston, MA. 1955 – “Ah one anna two…” ABC Television premiered The Lawrence Welk Show. In Welk’s 24-piece band was the ’Champagne Lady’, Alice Lon. 1961 – Novelist Ernest Hemingway commits suicide at his home in Ketchum, Idaho. 1964 – Signifies the date it was no longer legal in the United States to discriminate against others because of their race. It was on this day that U.S. President Lyndon Baines Johnson signed the Civil Rights Act of 1964 into law. The law included the prohibition of discrimination on the basis of race, not only where the registration of voters was involved, but also in public accommodations, in publicly owned or operated facilities, in employment and union membership. 1976 – North and South Vietnam are officially reunified. 1980 – President Jimmy Carter reinstates draft registration for males 18 years of age. 1985 – Joe Niekro earned win #200 in his career by leading the Houston Astros to a 3-2 victory over the San Diego Padres in the Astrodome. Joe, famous for the knuckle ball, has a brother, Phil. 1990 – A stampede of religious pilgrims in a pedestrian tunnel in Mecca leaves more than 1,400 people dead on this day in 1990. This was the most deadly of a series of incidents over 20 years affecting Muslims making the trip to Mecca. 1995 – “Forbes” magazine reported that Microsoft’s chairman, Bill Gates, was the worth $12.9 billion, making him the world’s richest man. In 1999, he was worth about $77 billion. 1997 – Men in Black opened in the U.S. Agents Kay (Tommy Lee Jones) and Jay (Will Smith) expose a plot by intergalactic terrorist Edgar (Vincent D’Onofrio) who has beamed (or whatever) to Earth to assassinate two ambassadors from opposing galaxies.